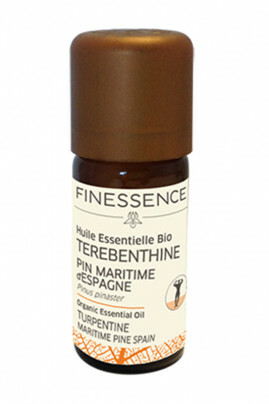 The soothing and relaxing virtues make the Finessence Organic Essential Oil Turpentine a true muscle relaxant. Appreciated by athletes, it relieves joint pain and stimulates blood circulation. It is very useful in case of rheumatism, sciatica and osteoarthritis. It can also be used to decrease and facilitate healing of bruises. In atmospheric diffusion, its balsamic smell with toning and stimulating virtues is very interesting in case of fatigue and lack of concentration. Soothe your painful areas with the Finessence Organic Essential Oil Turpentine ! In infusion : In a lukewarm and not boiling, mix 3 to 4 drops that you have diluted to be one of sugar. Air diffusion : Pour a few drops in your diffuser and let broadcast 30 minutes for a large room and about 15 minutes for a room. Comply with the device used. In organic cosmetic care : The Organic Turpentine Essential Oil of is very diluted in a rich vegetable oil. Pour 4 drops of essential oil for 1 teaspoon of vegetable oil and massage delicately on the area concerned. Pinus pinaster leaf/twig oil, limonene*.